When Amber of In the Loop moved into her new home, all of her windows had new shades… except her bathroom! Privacy was a must, so after going on an office tour at Blinds.com with other bloggers, Amber decided that her bathroom window decor needed a little help from us! Amber is an Oklahoma native who moved to Houston, TX with her husband and adorable dog, Barkley. Her blog In the Loop, features lifestyle, DIY and tech tips. To get much needed privacy in her bathroom, Amber chose Radiance 3″ Room Darkening Sheer Shades. When the fabric vanes are tilted open, sheer fabric lets in light but maintains a level of privacy. Amber added a motorized lift to her shades so she can raise them with the touch of a finger. After choosing the perfect white for our bathroom, I had to choose how to open our new sheer shades. I decided to upgrade to the remote controlled battery operated motor because, well, why not!? This would be a perfect feature for a home with a small child. It keeps the cords up out of reach of little hands and is a great safety feature. Plus it’s really cool! When Amber wants a little more light control, or nighttime privacy she can tilt the vanes completely closed. Amber’s motorized lift is a cordless power wand that stays attached to the shade so you never misplace it. Amber filmed her husband using the motorized wand for the first time to show just how fun they are to operate. 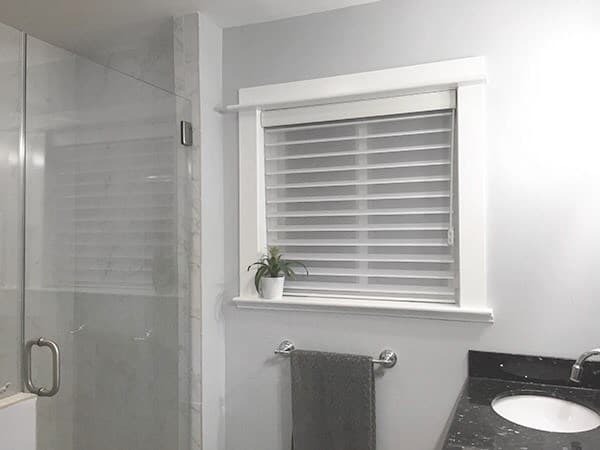 For more information about Amber’s bathroom makeover, be sure to check out her post, New Sheer Blinds from Blinds.com. Amber chose Radiance 3″ Room Darkening Sheer Shadings in Shadow 3″ Crystal 32100. Good choice! It sure is pretty and I like the versatility with the sheer option.